Ahhhhhhhhh, chili dogs. Chili dogs, chili dogs, chili dogs. That’s right, my friends, the first chili dog I will review as a nyweenie bloggist starts right now. Before I begin, I need to preface this review with some very important information. The placement of chili on a hot dog as a topping is the single greatest thing to ever happen in the realm of food. Yes, mustard is the most important condiment for a hot dog, but that seems like a logical decision. 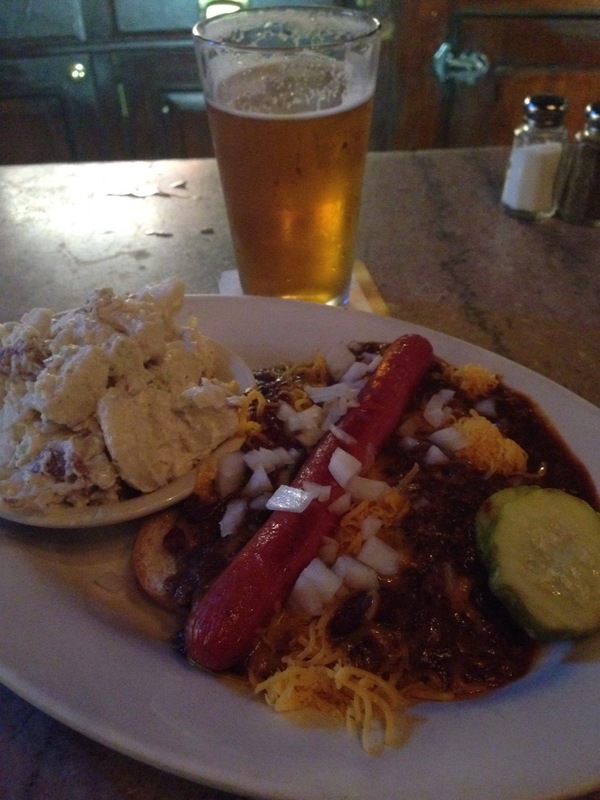 Adding chili to a dog, well, that’s just flat out creative. Add 10 cc’s of creativity with a double dose of meat on a bun, then top it off with a little cheese. I’m pretty sure that is exactly what lies behind St. Peter and his gate. Now, I will try to be as unbiased as possible as I walk you through my experience at Old Town Bar. 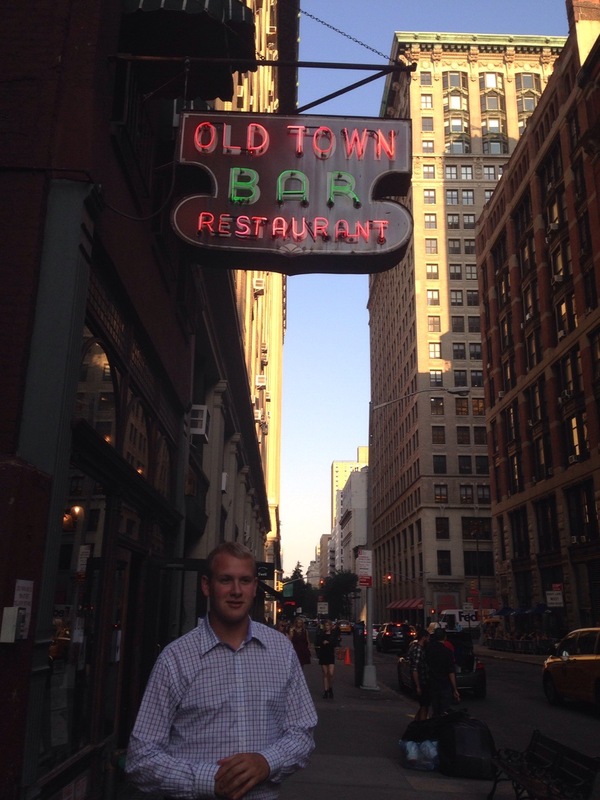 Located on 18th street in the Flatiron district, Old Town Bar looks just as it sounds: old. This isn’t a negative usage of the word “old”, though. This place has character. The floors are aged tile, and the bar is marble. With high lofty ceilings, a lot of dark wood, and some chandeliers, I feel like I’m in another era. The beer selection is also wonderful. There is nary a TV in the establishment, and to quote my good friend Mike, “There’s not a single TV in here. This is a bar for drinking.” I order the chili dog, and it is easy to tell that it is a featured item on the menu, as it is in red, and in parentheses “(As featured on Martha Stewart)”. Well, now I’m excited, because if Justin Bieber is cool with getting roasted by Martha Stewart, I am definitely cool with eating a hot dog she recommends. The weenie comes out, and it looks and smells amazing. Doused in chili, I can’t even see the bun. Quickly I realize that I won’t be able to pick this up and must attack with a fork. The first bite is great. The chili has some nice spice, and the frank is certainly of high quality. There is a nice little layer of shredded cheddar on top that melts just enough to please. On the side, I ordered potato salad which is a refreshing option over the usual fries or no side at all. Eating this dog is a full dining experience. At 11 dollars, this is one of the priciest dogs I’ve had, and it is truly wonderful. However, I can’t even pick it up, which is quite bothersome. It almost seems as if I’m not eating a real hot dog, and that takes away from the experience. We’ve found ourselves in a territory beyond buns, and it just doesn’t feel like home. It sure does make for a good picture, though. After some intense deliberation, I have finally come to a rating: 3.5 weenies. This may seem low based on what I wrote previously, but keep in mind that I am rating the hot dog. The experience is certainly a factor, but ultimately I’m looking for the best hot dog in NYC, not the best bar. As far as bars go, I highly recommend Old Town Bar. 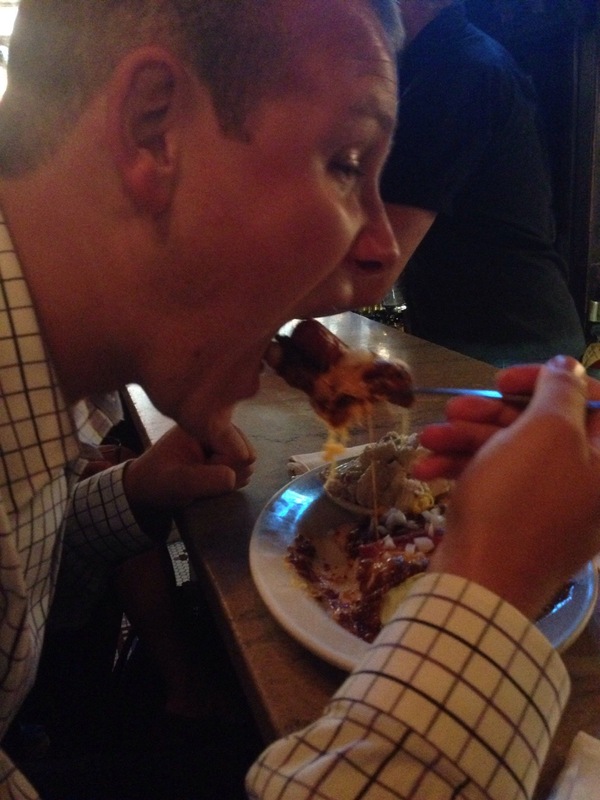 In fact, I will definitely be back to eat a standard dog and enjoy another craft beer. Old Boys like old bars. This old boy really liked Old Town Bar.